Due to its proximity to the Angel Inn at number 1 High Street, the building occupied by Becket and Young has been depicted several times, so we can get a fair idea of what it looked like. 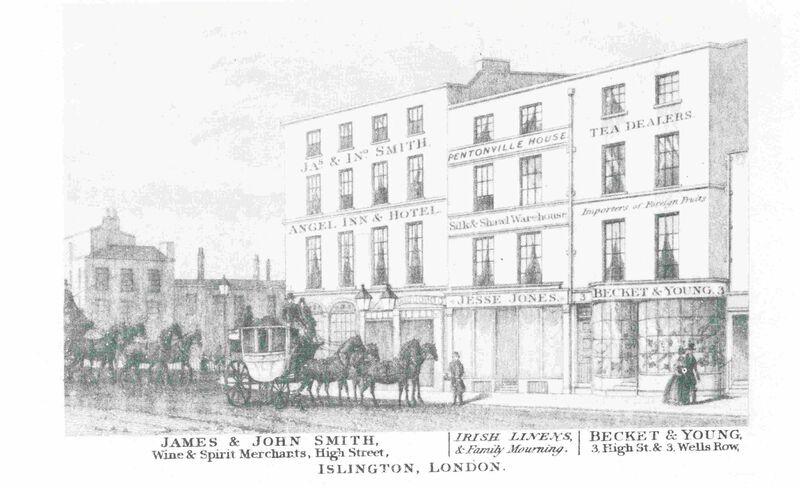 The two pictures below are both from the 1820s and show the Angel Inn as the large building on the left, then a draper’s shop at number 2, called Pentonville House, and next, Becket & Young’s grocery business. 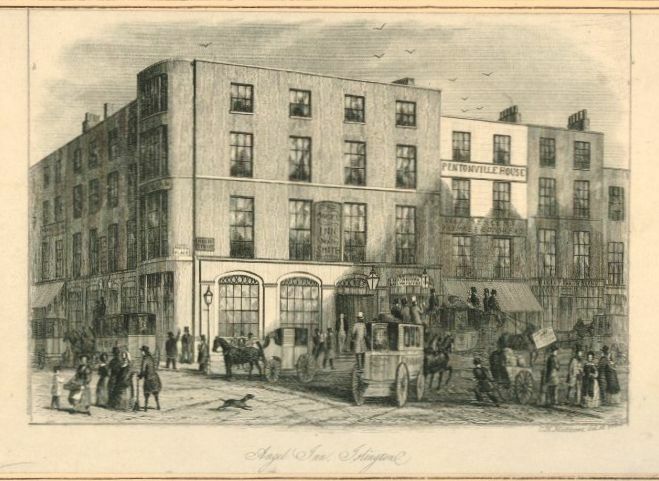 The Angel Inn used to have a larger front in the High Street, but when it was rebuilt in the early 1820s, the northern section was turned into two houses, that is, numbers 2 and 3 High Street. 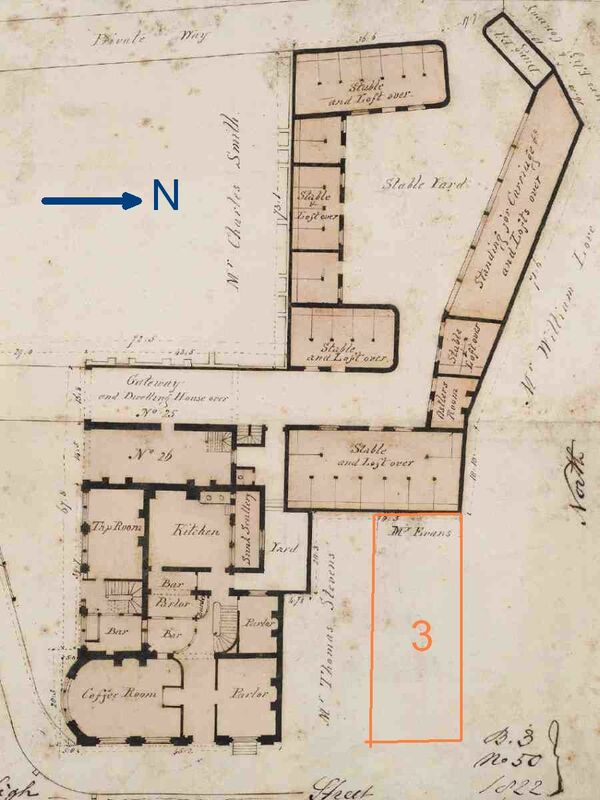 A ground plan exists of the 1822 situation of the Angel Inn and although the building does not look that big from the High Street, it comprised more than just the building at the corner of High Street and Pentonville Road. It ran a long way back in the north-western corner where the stables and outbuildings could be found. The plan below is orientated towards the west, so the north, that is, the direction of the High Street towards Upper Street, is found on the right-hand side of the plan, while the top of the plan points towards the west. It is the same orientation that Tallis used in his Street View of High Street. I have drawn the plot for number 3 in orange. It has the name of Mr. Evans written at the top of the plot, which is Edward Evans, a linen draper, who moved into the newly built shop, but did not last very long as in 1826, bankruptcy proceedings were taken out against him. (1) Whether Becket and Young moved in immediately after Evans’s bankruptcy is not clear. 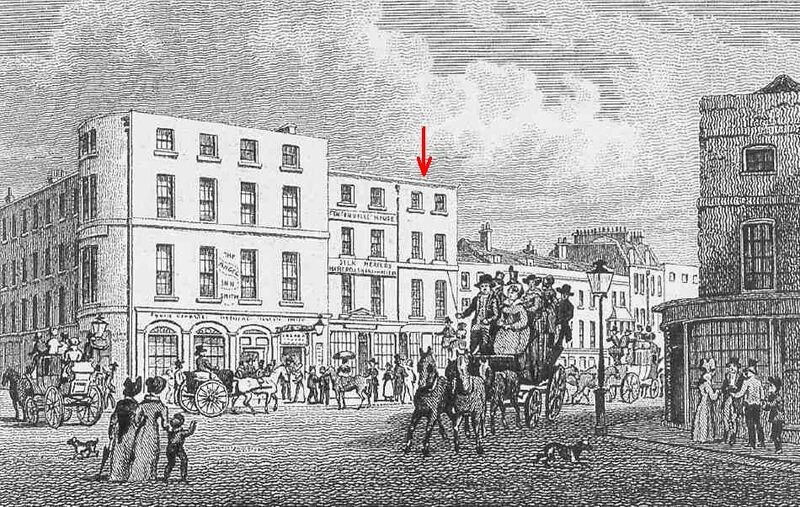 When Becket’s first wife died in 1832, she is said to be of High Street, but no house number is given, so perhaps not yet of number 3, but still of number 10 where Pigot’s Directory of 1825-6 had listed Becket. Becket & Young are definitely at number 3 in 1839 when the next Pigot’s Directory was published. When the street was renumbered later in the century, numbers 2 and 3 became 3 and 5 and were combined into one business when Lipton’s occupied the premises in the 1890’s. A new shop front was added in the 1930s and the combined building now houses a pub that appropriated the name of the original inn at number one, The Angel. I have found no advertisements for Becket & Young’s grocery shop as such, so except for the tea and foreign fruits you could buy there according to the lettering on their building in the Street View, we do not know what was on offer. But, you could register your lost property with them and when doing so, you could of course also stock up on groceries. (1) The London Gazette, 24 November 1826. (2) The London Gazette, 11 May 1852. (3) England & Wales, National Probate Calendar (Index of Wills and Administrations), 1881, 1883, 1885.